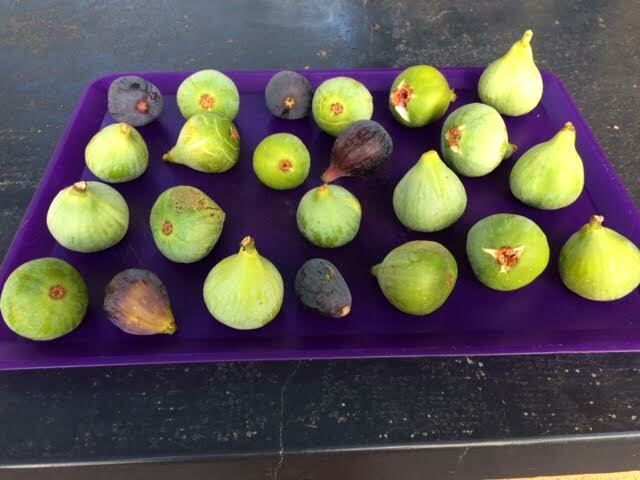 It’s fig time here in northern California and by all accounts, this is a banner year for them. 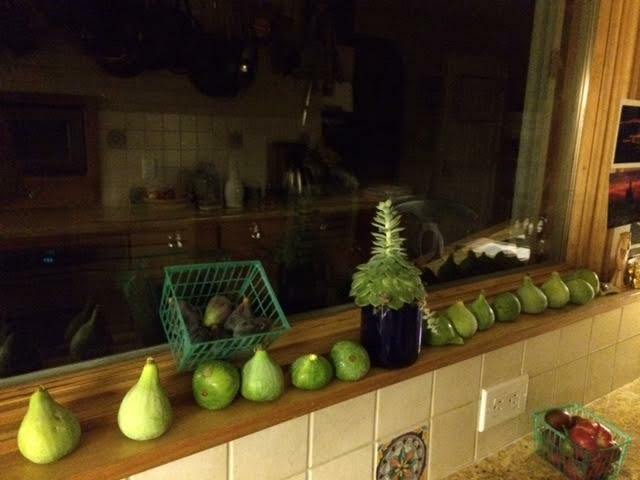 The tree in my backyard is producing lots and I have them spread around the kitchen waiting to be grilled, put in salads, blended into smoothies, stuffed with cheese and popped in my mouth. The variety of my tree is supposedly a striped panache; and while they do have the telltale dark red interior of that variety, there are, so far, no stripes. 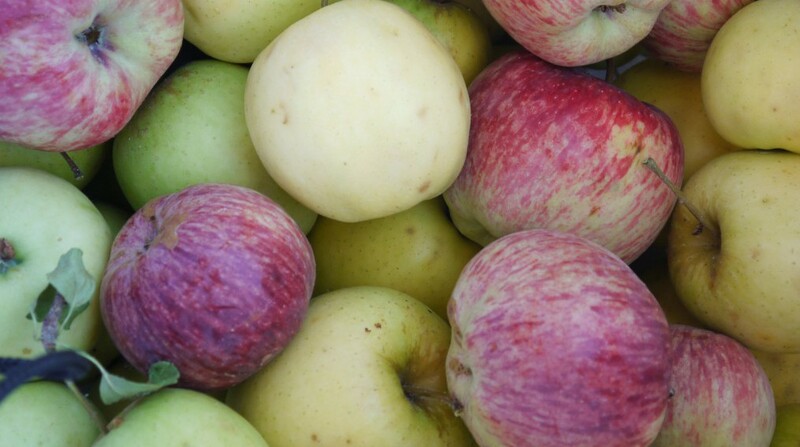 I’m also picking black mission, brown turkey and some mystery types from trees around the neighborhood. 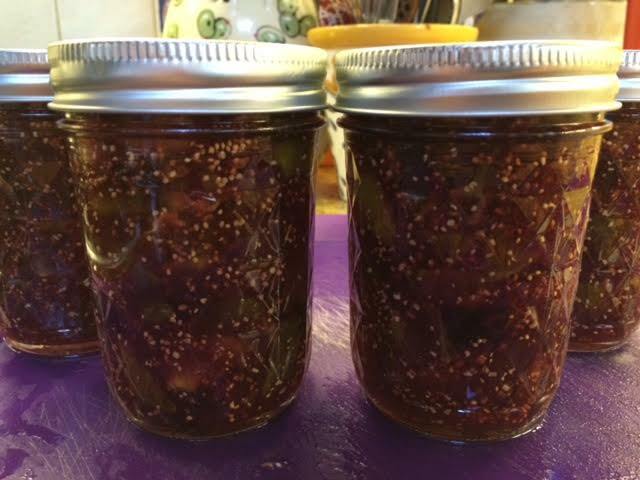 The other morning I made a chunky fig jam, which didn’t take long at all to put together. 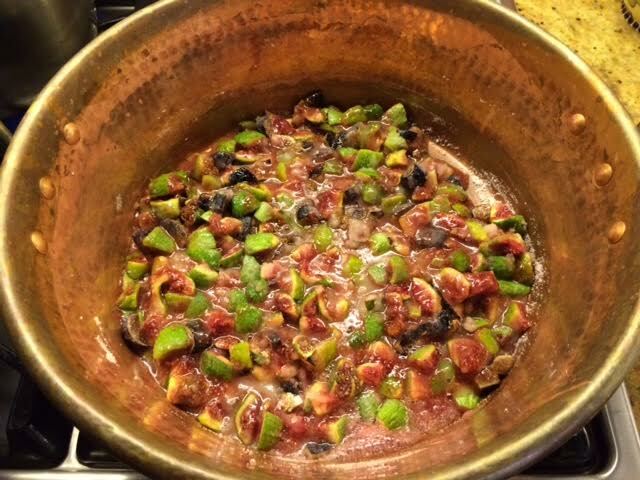 I chopped the figs in bite-sized pieces and combined them with sugar, lemon juice and vanilla bean seeds. The aroma was heavenly! Before too long, the mixture reached a perfect gel and was ready for jars. I’m looking forward to baking newton style cookies with the jam and swirling it into a pan sauce for duck and chicken, and I can’t wait to serve it with cheese and charcuterie, like the fantastic burrata platter I had today at Il Davide restaurant in San Rafael, California. Molto delicioso! Place all ingredients in a large, shallow, non-reactive pan and bring to a boil. Lower heat and simmer over medium heat until jam forms a gel. Ladle into sterilized jars and process in a canner for 10 minutes. This entry was posted in Preserving, Recipes and tagged burrata, charcuterie, cheese, figs, jam, vanilla. Bookmark the permalink. ← When life gives you zucchini…..